Known for its wide performance versatility, from pacemaker and biventrical implants to bypass checks and AAA repair, the Philips BV Pulsera C-Arm was designed to bring C-Arm imaging departments to the next level. In terms of power, this C-Arm offers a steady stream of uninterrupted imaging power, ideal for long interventions or open surgery. Its imaging is further advanced by its pulsed acquisition and 30 pulses-per-second speeds. Moreover, this speed and power allow for lower radiation doses and high levels of contrast. As such, motion artifacts are eliminated and users can expect top 3D imaging with little blurring.Speaking of dosage, the Pulsera C-Arm uses DoseWise technology and unique beam filters for a full range of radiation management. 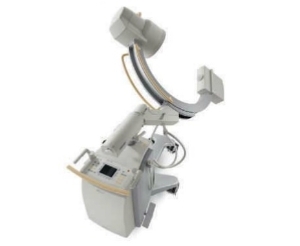 The Pulsera’s C-Arm includes enhanced viewing for operators through its 12-inch touchscreen monitor and Mobile View Station, an ergonomic, adjustable viewing station that operators can place close to the operating table.